"The first Smooth - Jazz Jam Band"
Tracks recorded featuring some of LA's top session musicians. The pop instrumental set was produced by Jessie Allen Cooper and former Rippington Steve Reid, and recorded at Steve Reid's Sonic Jungle on The Famous Trident Console from the old A&M Studios. This is your invitation to connect to a musical world that embraces a stunning collection of genres and instrumentation from Jazz and Rock to Blues, Latin, and other international influences. It's a world inventively crafted by sax man Jessie Allen Cooper as he combines the organic sound and feel of real instruments with ten stunning original compositions to create a magnificently varied and brilliantly performed project. 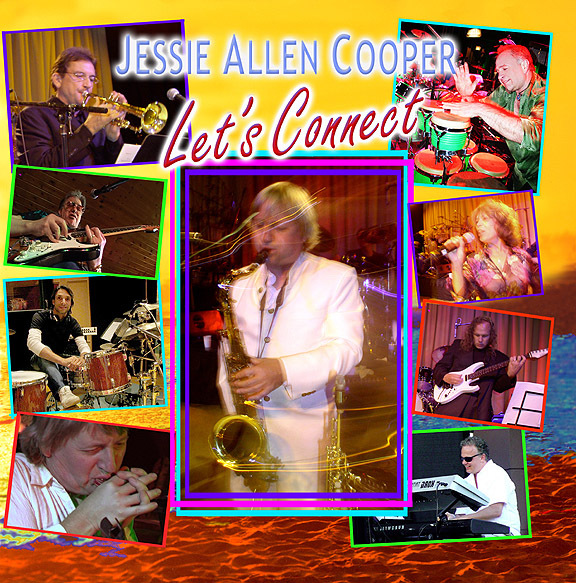 Jessie calls "Let's Connect" his horn album, since the emphasis is on his own tenor/soprano sax and harmonica leads in addition to some tasty Miles Davis inspired trumpet / flugelhorn work from Jimmy Hale. This is also a highly percussive album, featuring a potpourri of rhythms from Steve Reid's incredible percussion toy box. Steve has actually built some of the instruments himself! Jessie Allen Cooper has created an exceptional chemistry here among this elite group of seasoned players. So, do check out the song credits as you listen, to see who is involved in this amazing project. 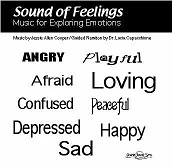 Most importantly, allow the remarkable songs in this album to assist you in finding the pure joy that great music can bring. thought in mind, enjoy connecting with this positive musical energy! Sometimes it seems like it was only yesterday, but it was almost 20 years ago when Jessie Cooper and I embarked on our first recording project together. I had just built The Sonic Jungle Studios and Jessie's project, "Moment in Time," was one of the first in a long line of successful records. It was great working with Jessie back then and, like a fine wine, time has made it even better. Fast forward twenty yearswith eight CDs to Jessie's credit, three of which we collaborated on. And here we are at the end of another project. This record is mature and engaging; it crosses many musical genres and will sonically jump right out of your speakers. As usual, Jessie and I both put our hearts into this one, and I think there are some real gems on it. One of my objectives for "Let's Connect" was to show the world another side of Jessie Cooper. I wanted to feature Jessie's natural talent with his first instrument, the Blues Harmonica. Jessie reaches deeply within his soul when he plays the Harp (Harmonica). The mixture of Harp and Sax within a myriad of organic and world textures will surprise and delight even the most discriminating ear. Recorded at: The Sonic Jungle Studio, North Hollywood, CA. Cooper Sound Waves, Santa Monica, CA, Krizman's Farm, Venice, CA. pre-production and track transfers - Steve Reid and Steve Katz. Pixie Vision Productions / S. Reid, and Lori Hoffman /Jessie by the Ocean.